Hey everyone, sorry again for the interminable gaps in posting. I’m working through Shadow Hearts: From the New World at the moment, and only have a limited time to play. To make up for that, I’ll offer–when I can–reviews by guest writers. Anne recently finished an old Legend of Zelda Game (hey, I’m not playing this one), so she’s donated her time, and I’ve linked her name to her website. Enjoy! Show of hands: who got stuck trying to figure out how to hurt this guy? The character Link must be doing something right because everyone seems to think he’s trustworthy. It must be something in his face because, let’s face it, it isn’t his winning personality. Unless I miss my mark there have been 16 original Zelda games and all use Link in some form or another (some weirder than others…Twilight Princess) as the endearing and trust engendering protagonist. Think back on any one of the games you might have played and you’ll notice that people turn to Link right and left with their problems from chasing down cuckoos, to saving Zelda…again, to spending countless hours slogging from watery ruin to firey cave in search of magical macguffins (and those are a bit of a Zelda trope all on their own). Now why does this matter you may ask? After all, he proves his worth every time he mops the floor with Gannon and gets the girl (oh wait, no he doesn’t). Well, here’s the thing, maybe we’ve all gotten it terribly wrong and I think the entire island of Koholint would agree with me. 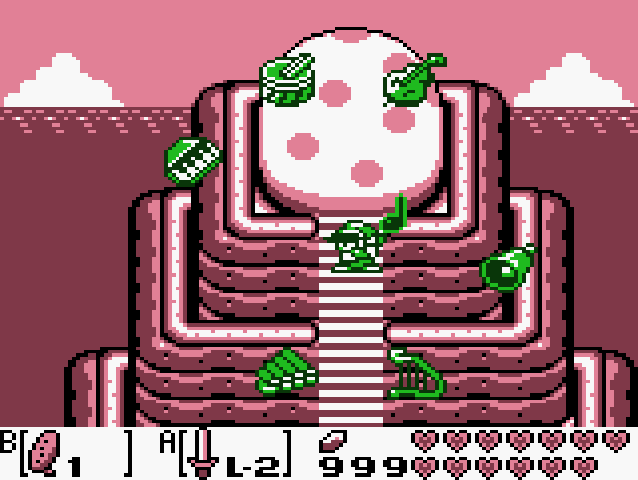 At the core of it, The Legend of Zelda – Link’s Awakening is the story of Link’s journey into mass genocide, as he knows full well that his quest to wake the Wind Fish will result in untimely oblivion for the island and all its residents. Since this game review is coming out 20 years after the game’s first release I feel I won’t be blowing anyone’s mind and feel that the statute of limitations on Spoilers! has long since passed. The game starts with Link washing ashore on the Island of Koholint where he is greeted by a young woman who will later star as a Resident Evil IV Ashley replacement as you go on a babysitting quest to take her to the talking animal village (cue rainbow effects and sparkles). Link quickly finds out that his room and board on this island won’t be free as they’ve decided that he is the legendary hero who will wake the Wind Fish from its slumber, thus making the isle of Koholint vanish with his dreams; although why this would be a good thing for anyone other than Link is never fully explained. 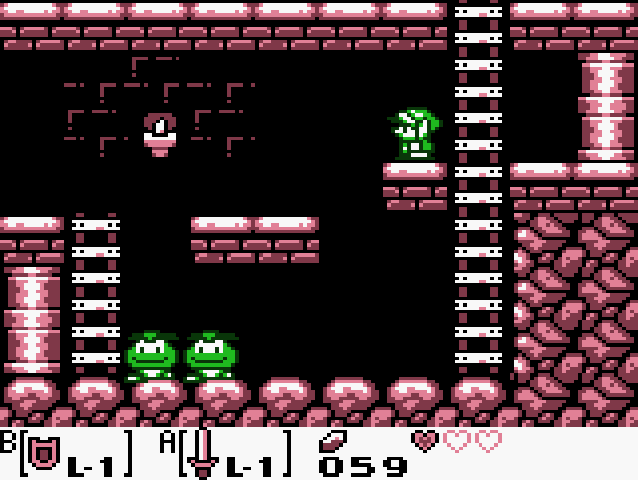 Speed forward through eight atmospheric dungeons that can be won only by using that dungeon’s brand new item and a trading sequence so long that it has it’s own mathematical cross stitch proof out on the internet (search ‘link’s awakening trading sequence cross stitch’ on Google and it’s the first image you’ll see). Oh and did I mention that music in these dungeons leaves something to be desired? Imagine being on the world’s longest elevator ride with a five year old who is singing you a song that she just now came up with…for five hours! 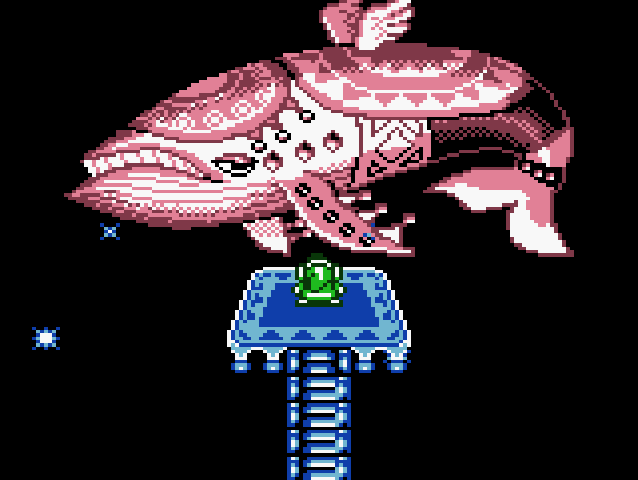 Finally with all the magical macguffins, sorry ‘musical instruments’ as well as the requisite ocarina (apparently when they said you needed eight instruments they forgot that the ocarina is by definition an instrument) in hand Link goes off to wake the Wind Fish. Unfortunately, his (or perhaps her) egg turns out to be full of monsters that, for the most part, are shadow clones of previous dungeon and game bosses that you’ll easily recognize. Without giving the exact ending of the game away, let’s just say the survival rate for anyone not named Link is rather low. It’s no longer a cute cameo when you tell Link to fight like Mario. All genocidal tendencies aside the game turned out to be incredibly fun to play. The designers thought up a lot of interesting characters (several of whom are making appearances from other games) and regions that keep the game from getting too bogged down in the go to dungeon A, get item B, use key C to get in and defeat boss D and get macguffin E, repeat, formula. 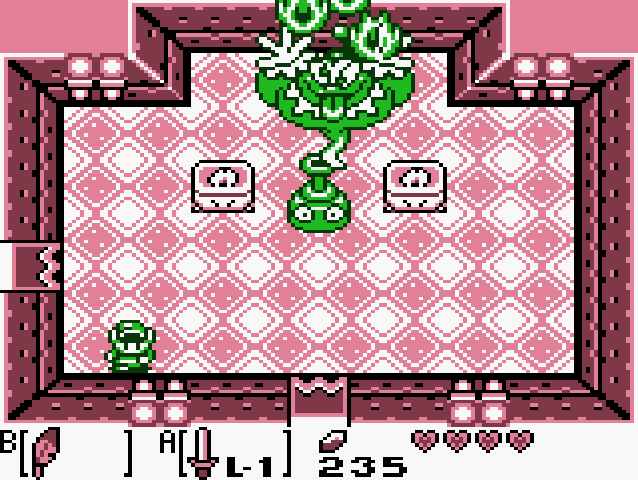 I will say that in the original version of the game for Game Boy there were far fewer owl statues than in consequent versions for the Game Boy Color or 3DS, which led to several sections that you might never think of on your own without a stealthy walkthrough peak. The Color and 3DS versions also introduced the upgrade Link uniform quest that could either increase defence or offence depending on the player choice. Note that the only instrument he’s actually playing is the one he wasn’t specifically instructed to find. So, the final overarching question for this revue: Is Zelda: Link’s Awakening a game worthy of our time? Yes. The game has enough entertaining points to offset any minor problems (or irritating music). The game is not my favorite Zelda (that position is held by Zelda: Ocarina of time) but it is a close second and is eons ahead of Majora’s Mask and Spirit Tracks. If you liked the style of the old Zelda games and are tired of the oddities of current generation Wii mote flailing consider giving this retro gem a spin. This entry was posted in Game Boy, Game Boy Color, Guest Writers, Legend of Zelda and tagged game boy, Game Boy Color, The Legend of Zelda. Bookmark the permalink.